The Learning Commons in Falvey was officially dedicated on Feb. 17 when library and University planners, architects, designers, faculty, staff, students and visitors gathered to celebrate the new home of the Falvey Research Center, Learning Support Services (LSS), the Math Learning Resource Center (MLRC), and the Writing Center. Upon his arrival, University President, the Rev. Peter M. Donohue, OSA, PhD, ’75 A&S, toured the Learning Commons, greeting each center’s director and asking about the new student lounge space, event rooms and special collections. 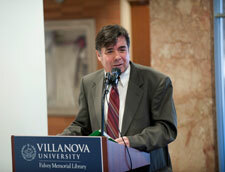 Distinguished guests, including academic deans and administrators, were invited to the event. There were also lively reunions between current and former library staff, some of whom had retired or moved away. University Librarian Joe Lucia opened the ceremony by expressing his pleasure at welcoming guests to celebrate the “realization of our dream.” The Rev. Dennis Gallagher, OSA, PhD, offered a blessing and prayer for our “academic community and all who will use this transformed space.” The Rev. 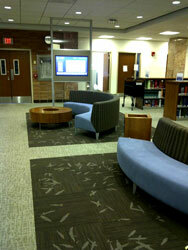 Kail Ellis, OSA, PhD, complimented the aesthetics and remarked on the ease of access to offices in the commons. Melissa Ferreira, MLRC director, expressed her delight with the new math center space and noted that “in just the few weeks they have been open” she has noticed the “positive impact on students.” Nancy Mott, LSS director, also commented on their move from a space-challenged location on campus to their new “home” in Falvey, citing the “20% increase in one-on-one study skills” sessions. Feeling lucky to have “snagged an office” in the Learning Commons space, Jutta Seibert, Academic Integration team leader and Research Center co-coordinator, conveyed her hope that this new “inspirational space” will lead to the completion of future phases of improvement, including the proposed atrium that will open up the space between Falvey Hall and Falvey Memorial Library, creating yet another “uplifting experience” for library patrons. In addition to Simmons, Ferreira, Mott and Seibert, Lucia also acknowledged the contributions of Ken Valosky, University chief financial officer; BLT Architects; Jim Matthews, Facilities project manager; Florence Reif, Facilities interior designer; Margaret Duffy, Falvey Business & Administration team leader; Judy Olsen, Communication & Publications team leader; Joanne Quinn, Falvey design specialist; Luisa Cywinski, Falvey Access Services team leader; and the many other library teams and individual staff members whose assistance, patience and good humor were greatly appreciated. Touchscreens at either end of the floor displayed an interactive map, staff directories and event announcements. And in the spirit of celebration, a beautifully decorated cake and other refreshments were served to guests, who lingered long after the formal remarks to take a closer look at the Learning Commons. We hope other Villanovans and visitors will do the same.